Download the full report to learn why today’s resource planning process doesn’t work for portfolio managers and how to gain transparency for a better resource planning solution. 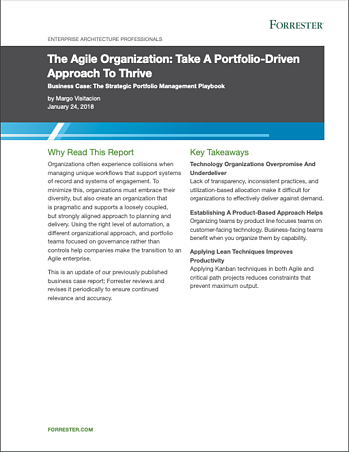 Gain access to recent Forrester research on a portfolio-driven organization. Technology Organizations Overpromise And Underdeliver: Lack of transparency, inconsistent practices, and utilization-based allocation make it difficult for organizations to effectively deliver against demand. Establishing A Product-Based Approach Helps: Organizing teams by product line focuses teams on customer-facing technology. Business-facing teams benefit when you organize them by capability. Applying Lean Techniques Improves Productivity: Applying Kanban techniques in both Agile and critical path projects reduces constraints that prevent maximum output. To view the entire report fill out the form above.